When I think of winter, I think of cold temps and snow, lots of it. But this year winter didn’t show up in western Canada. 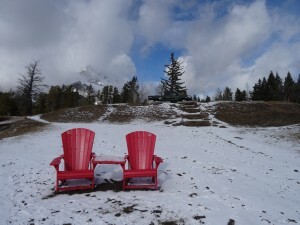 Castle Mountain Resort in southern Alberta closed its ski hill in mid February because the white stuff disappeared. In Banff, parka-clad tourists strolled Banff Avenue as locals scurried by in shorts, the clear sidewalks and brown hillsides more in keeping with late April than mid-winter. I had headed to the mountains to try fat biking, a cross between mountain biking and skiing. “We are not renting out fat bikes due to the lack of snow,” chirped Jenn at Soul Ski & Bike, “but you can rent a mountain bike.” With dreams of winter adventures fading fast, White Mountain Adventures came through with a promise of snow in the midst of one of the warmest winters on record. 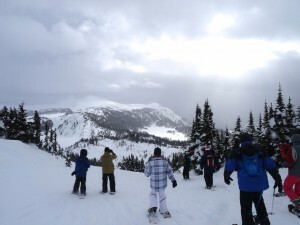 It wasn’t fat biking, but several days each week White Mountain Adventures take snowshoers to the alpine meadows above Sunshine Village. At 2,240 meters, “there’s lots of snow up there,” guide Magda Idasz promised, when she picked me up for a half-day tour. At the Sunshine parking lot, Idasz handed out snowshoes, the light metal, synthetic fabric, and meter-long length suitable for navigating deep powder. After assuring our group of ten that we would not be in avalanche terrain even though we were headed to the backcountry, Idasz had us carry our snowshoes onto the gondola and then Standish chairlift. As we had left Sunshine ski resort, Kim Titchener, a local bear expert, had told us to watch for bears as some were stirring with the warm weather. Now, I looked at the shallower snow pack we crossed en route to Rock Isle Lake and wondered if we might encounter a confused grizzly. I asked Idasz what signs people had seen that indicated bears were waking up, thinking perhaps of empty dens. “They are actually seeing bears,” she said, ” a black bear was spotted near Bow Pass in the park.” With our puffy winter clothing, we could have been mistaken for giant corndogs by a hungry bruin, but Idasz was carrying bear spray and the only tracks we saw belonged to snowshoe hares and pine martins. My hopes for blue-sky photos faded as skies darkened and snowflakes began to drop from the sky however it gave me hope that winter would continue to provide snowy adventures, even if we have to travel higher to find them. One of the warmest winters on record is leaving Canada wondering. Click to Tweet. Are snowy winter adventures disappearing for good in Canada? Click to Tweet. How far do you have to go to find snow in the mountains of Alberta? Click to Tweet. If paying to watch someone else work sounds like a strange holiday, you might be surprised at how much fun you can have onboard a freighter. The Uchuck III started its career as a minesweeper in the 1940s and was reinvented as a supply vessel for logging camps, fish farms, and aboriginal communities with no road access. Up to 100 passengers tag along to peek at a lifestyle vastly different from one with roads and big-box hardware stores. There is no set itinerary on the Uchuck III and no one tells you exactly where you will be going – just that you will return to your starting point of Gold River, a community of 1500, by suppertime – more or less. If the captain takes longer to offload fuel or stops to watch whales, you will be late for dinner. It was a bit like that when Captain Cook sailed these waters in 1778. His first encounter with Canada was at Nootka Sound where he was so enamored with the sea otters, he stayed to trade for pelts and to claim the land for Britain. Unfortunately for Cook, Spain had already claimed these lands. But Spain had opted for drive-through trading, swapping metal for pelts while anchored never sending ashore a landing party. That decision almost led to war as Britain and Spain – ignoring the 4000 year presence of the Mowachaht/Muchalaht people – disagreed over who had title to the land and lined up their allies. The Dutch backed Britain in the dispute and France sided with Spain. With these superpowers threatening each other, the world’s eyes were on Nootka Sound for twenty years. War was averted when France decided it was overextended from the French Revolution and Spain searched for a negotiated settlement. By then, the sea otter population had been overhunted and the world lost interest in Nootka Sound. Now, the world is paying attention again as adventure-seeking tourists come from all over the planet to ride the MV Uchuck III. After the last Canadian sea otter was shot in 1929 a small population of Alaskan sea otters were reintroduced in British Columbia. Now you can see the animals that almost caused a war and enjoy touring the area that spurred our forefathers to extend our country from sea to shining sea. Turning Industry into Tourism via @Reinventure. Click to Tweet. 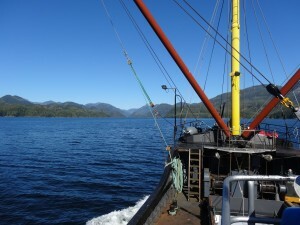 Get a glimpse of a day on the MV Uchuck III right here: Click to Tweet. The Uchuck III may seem like a strange holiday but you’ll be surprised how fun it can be! Click to Tweet.